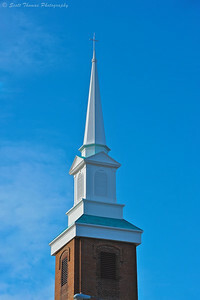 The new steeple on the First United Methodist Church in Baldwinsville, New York. Nikon D700/28-300VR, 1/400s, f/10, ISO 200, EV 0, 105mm focal length. 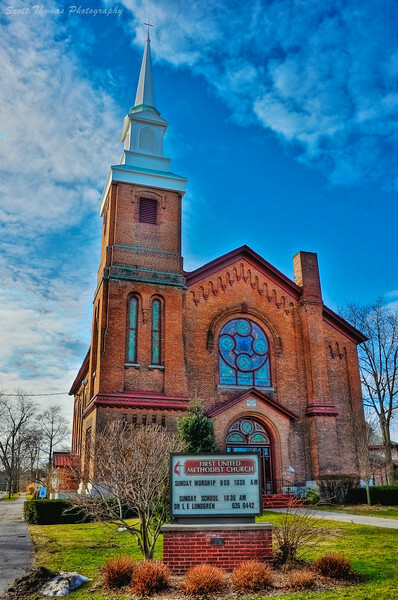 During my early years in the Village of Baldwinsville, New York, the First United Methodist Church had a steeple on it. The steeple was removed in 1968 due to structural damage. Well, being young and not one to notice such things, I only remember the church without its steeple though I must have seen it. I have photographed weddings and attended many community functions there since then. The pancake breakfasts held at the church are not to be missed. Never knowing the building was missing an original part of itself when it was built in 1870. Last December the steeple returned and it can been seen from all over the village. I knew I wanted to photograph it but good weather and time was hard to come by. On Sunday, I had my chance. I captured the steeple in its white beauty with good side lighting and a backdrop of blue sky and wispy clouds. The church looked okay in our unusual Winter season but I will return in the Spring when the trees have popped out their leaves and the grass greens up. I used a 5 image set of bracketed photos to create the High Dynamic Range (HDR) image below in Photomatix 4.0. First United Methodist Church in Baldwinsville, New York with its new steeple in place. Nikon D700/28-300VR, f/9, ISO 200, EV 0, 32mm focal length. This entry was posted in Travel and tagged 28-300mm, baldwinsville, blue, chruch, clouds, day, first united methodist, hdr, new york, nikon D700, photomatix, sky, steeple, vr, winter. Bookmark the permalink. Nice picture Scott! Quick question: Does your camera do the bracketing for you, or do you manually created the bracketed sets? Thanks. Yes, I can set auto-bracketing from 3 to 9 exposures at 1 stop intervals on my Nikon D700. I start with 5 which gets me +/- 2 stops. Sometimes I may need more depending on the range of light in the scene. If I need less, I just discard the unneeded exposures in post. I really like the HDR shot! It presents the scene very well! Thanks, Terry. How do you like our winter here? Last year at this time, you would not have been able to see the brick base of the sign the snow was that deep. Strange winter! It has been dry here lately but with pretty normal temperatures. Still snow remaining from previous storms and it has a high ice content so it will stay for awhile. That is something I need to learn how to do with HDR. There are ways to replace the sky from one of the exposures to make it look more natural. I’m sort of a purist: black coffee, no sugar–which is to say that I like the steeple against the sky. I’m beginning to understand the whole HDR approach, though, a little, I think . . .
Isn’t it astonishing how something like that steeple can become the focal point for a whole landscape? And how a steeple is such an essential element of our idea of “church.” Never underestimate the power of symbols. The church didn’t have a steeple since1968?? Wow, that’s a long time! I do like the HDR image, it looks like a painting.